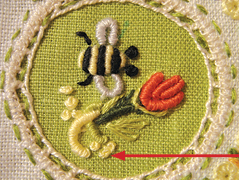 Openwork Embroidery - New Book! It's called A Bag Full of Aid and it is a relief effort for the people of the Emilia Romagna region in Italy who were hit by many earthquakes and strong aftershocks last May. 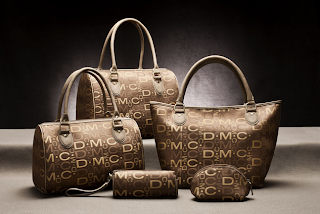 A Bag Full of Aid: DMC and Casa Cenina for the earthquake victims of the Emilia Romagna. A few months have passed since the earthquakes that struck the provinces of Modena, Ferrara, Reggio Emilia and Bologna, media attention has diminished but the process of reconstruction will still go on for a long while. Through Casa Cenina, DMC has decided to promote a charity initiative for the earthquake victims of the Emilia Romagna; a way to contribute to the rebuilding and to keep attention on the difficult plight of the earthquake victims. "A Bag Full of Aid" is the name of the initiative that will see DMC transfer 20% of the price of each bag and small case purchased through Casa Cenina to the earthquake emergency account set up for the Emilia Romagna Region. This high quality collection with detailed finishing is suitable even for those who don't embroider because these bags and small cases were made for the traditional use of these fashion accessories – and at the same time for easily carrying your stitching projects. A perfect gift for every woman ... even at Christmas! In fact, the initiative will be valid from July 28 until Christmas . Until all of the items are sold out, you can calmly choose the bag or small case that you prefer or that you wish to gift and help us in this initiative. The total donation will be posted on DMC's website and that of Casa Cenina at the end of the initiative. You can read the English pages of the Casa Cenina blog for more info. Which one will you get? I can't decide on just one!!!!! 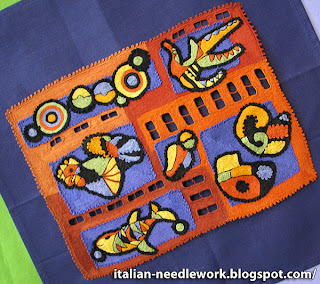 In the last couple of years, what we know as Chicken Scratch Embroidery has become very popular among Italian stitchers. 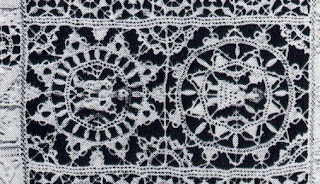 In Italy (and France) this technique is known as Broderie Suisse. Swiss Embroidery. It is also known by several other names in English, as is the fabric that it is stitched on: Gingham, Vichy, Checkerboard, ecc. 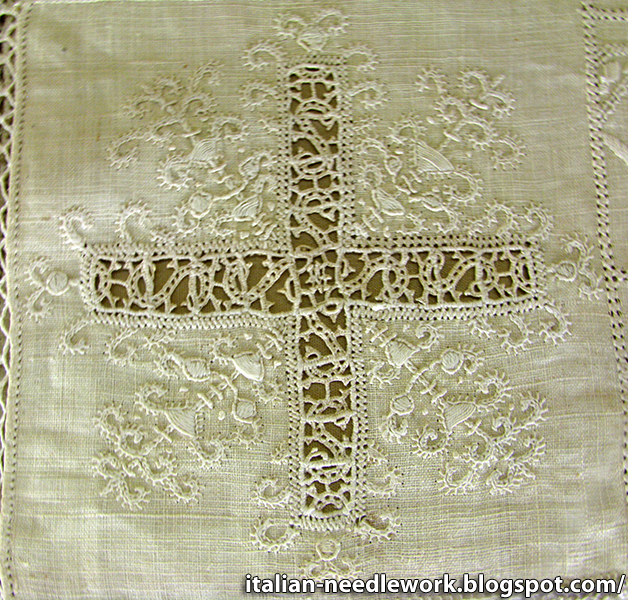 Origins are unclear and I can't tell you why the French and Italians call it Swiss Embroidery however, they have adopted it and the applications are very attractive and imaginative. The Italian firm of Fratelli Graziano has many styles of Gingham fabrics (under the name Riviera) suitable for the technique of Broderie Suisse, a larger selection exists in Italy than what we can get in North America. One noticeable difference is their Gingham fabric is made of linen, not cotton. You can however, still find cotton or cotton blend Gingham in Italian fabric stores. 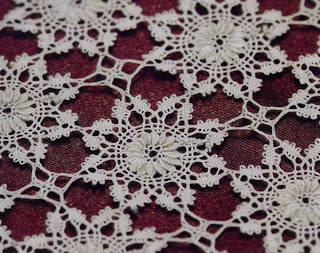 Anna Castagnetti of Ricami a Fili Tesi has her finger on the pulse of embroidery as usual and has just released a book on Broderie Suisse. A sample page from Broderie Suisse by Anna Castagnetti. 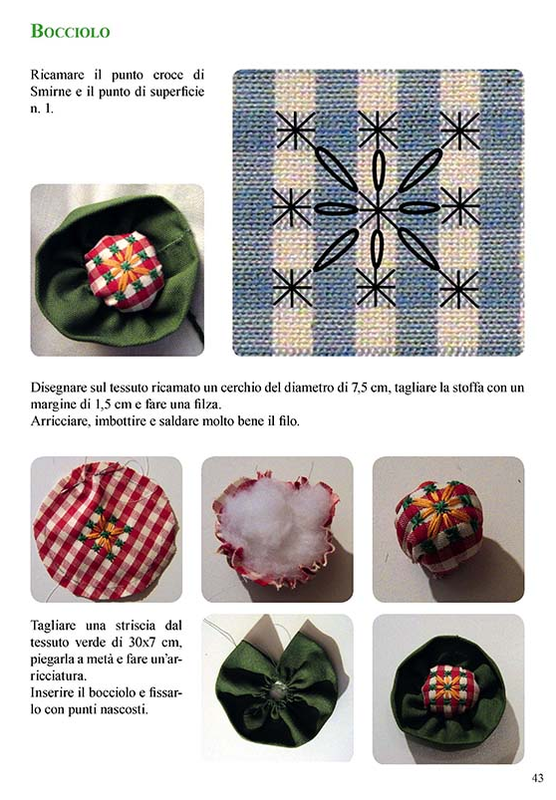 This volume of just over 60 pages (text in Italian) is packed with large, close-up, coloured photographs featuring numerous step-by-step series of many of the basic stitches and some innovative combinations, finishing instructions for 9 projects - each with several different combinations of patterns to choose from. Projects include bags of various sizes and uses, cushions, towel borders and Christmas tree ornaments. Colour choices are vibrant and eye-catching - there is no end to Anna's imagination! Anna is not constrained by geometry and she applies Broderie Suisse stitches as filling stitches for curved shapes as well as traditionally squared patterns and even produces some three-dimensional ideas! 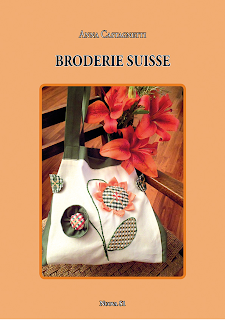 You can purchase this book on Broderie Suisse from Tombolo Disegni (look under Libri/Libri di Ricamo/Ricami Particolari-ricamo svizzero), send an email to order. 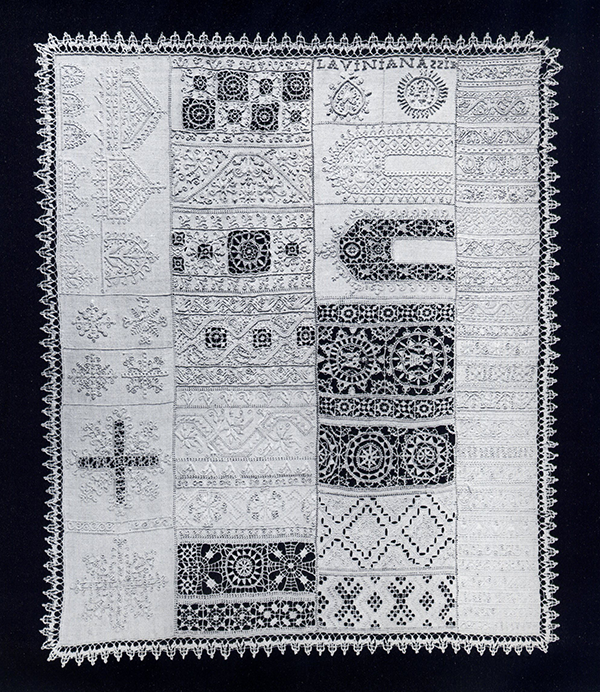 There is an Italian whitework sampler in the Palazzo Davanzati Museum collection which haunts me. I have never seen the whole thing up close as it is displayed all folded up in one of the glass cases in the embroidery and lace room on the first floor. photo from Merletti a Palazzo Davanzati. 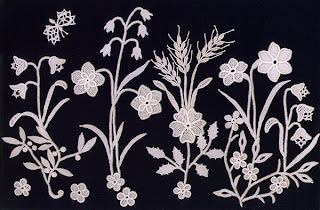 A series of stitches reproduced in the style of the second half of the XVI century: pulled stitches, drawn-thread stitches, reticello, satin stitch embroidery. 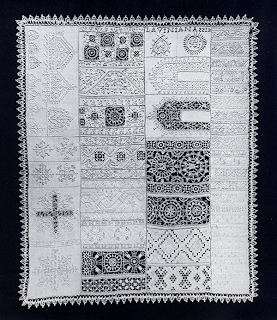 The sampler is probably 19th century and falls into the vast production inspired by the 16th century Italian pattern books, revived from pattern books by Pagani, Vinciolo and Vecellio, back in vogue between the end of the XIX century and the beginning of the 20th century, of which Aemilia Ars was among the most famous and perfect interpreters. I take as many photos of it as I can whenever I'm there. I'm totally fascinated by the wide range of work that is on it. The name Laviniana appears at the top. Who was she? How old was she when she did this? Was it meant as her resume? Perhaps that is not even the stitcher's name, perhaps it means something else? Oh the things I want to know! But there is also a lot of skill shown on this sampler. Unfortunately my photos of the reticello work are far too blurry to be of use. Is 2213 (or 2211) a bible reference? Why are they upside-down? To study this sampler properly I'd have to brush up on my symbolism and bible study as well as my needlework. I want to see the back of the work. I want to study it with a magnifying glass, with needle and thread in hand. I want detailed close-up macro photos! Most of all I want to be in Florence at the Palazzo Davanzati! Surprises in the mail are always welcomed and this time I want to tell you about Anna Castagnetti's latest book on her Ricami a Fili Tesi or Openwork Embroidery. 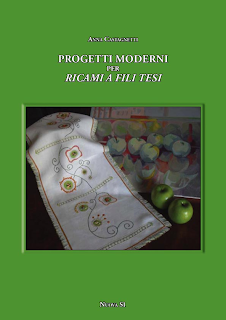 Progetti Moderni per Ricami a Fili Tesi [Modern Projects for Openwork Embroidery] is packed with fun, colourful projects for you to try your hand at this intriguing style of needlework. 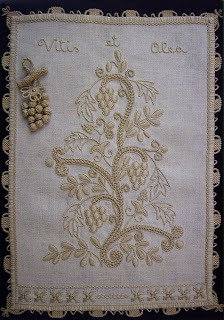 I especially like the cover photo which shows a table runner with a fun flowered vine broken up by some lovely hemstitching. 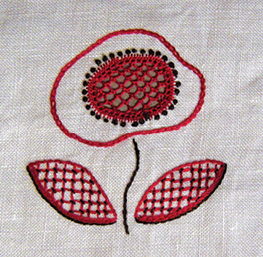 Anna likes to combine traditional techniques like Hedebo, Reticello, Drawn-Thread work and traditional embroidery and simplifying the more complex procedures, she always comes up with attractive designs. 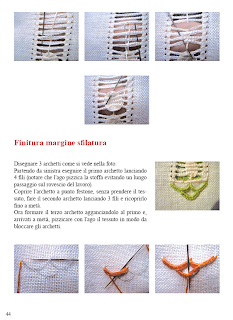 In this volume she has added other textile techniques to her projects like quilting! There are many little motifs to try and this is nice, in case you just want a little taste of something different to add to something you already have on the go. There are 13 exquisite little flowers, 3 Christmas panels, the table runner from the front cover and 2 purses to keep you going. 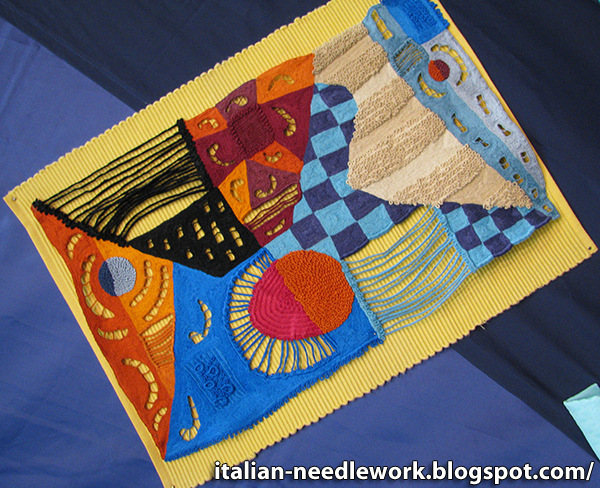 Stitch diagrams and patterns for assembly of the projects are all included. This book is a lovely follow-up to her first volume. You can purchase it from Tombolo Disegni, send them an email to order. 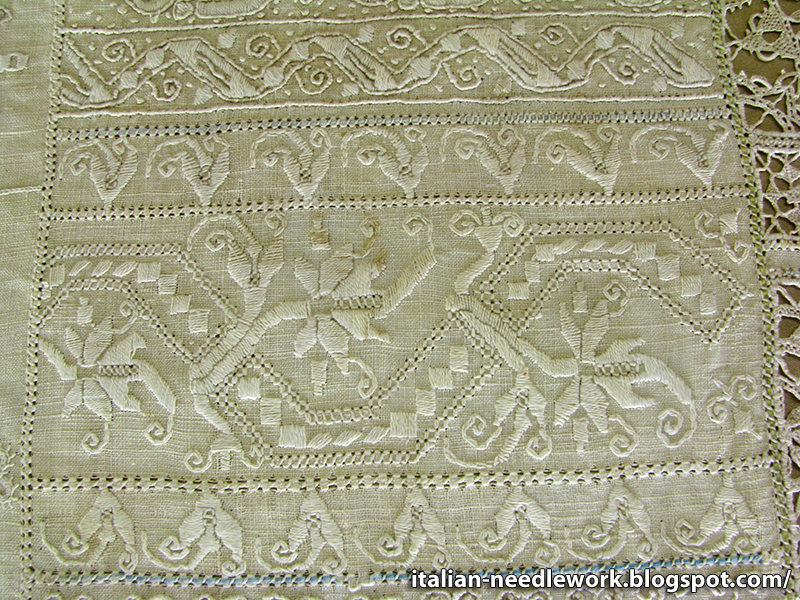 Though I have told you many things about my trip to the Italia Invita Forum in May 2011 in posts about Puncetto, Deruta Drawn-Threadwork, Ars Panicalensis, and Sicilian Drawn-Threadwork, I didn't really tell you much about the Forum itself. As my thoughts now turn to the next one coming up May 10 - 12, 2013 in Parma, I have been going over some of the things I saw and did at the Italia Invita Forum in 2011. 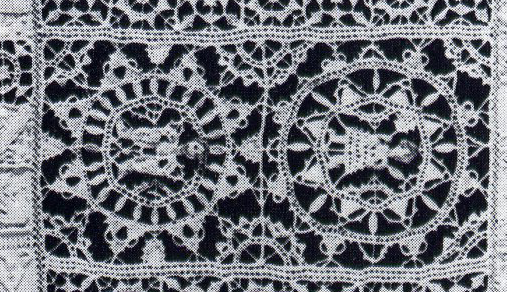 Pescocostanzo Bobbin Lace. Image from Herbarium Catalogue. 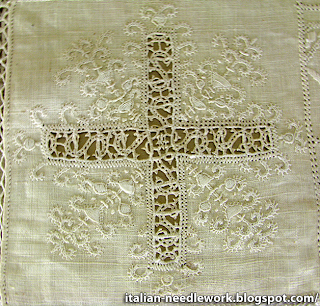 Aemilia Ars Needle Lace. Image from Herbarium Catalogue. Umbrian Embroidery. Image taken from Herbarium Catalogue. The umbrella of textile arts this time included weaving, quilting, knitting, crochet, felting and cross stitching added to the original embroidery and lace of years before. This was the 5th biennial event which started in 2003. 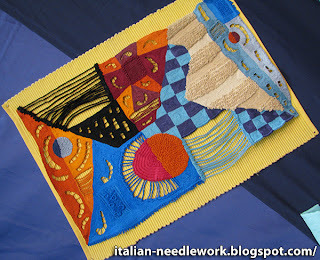 The Italia Invita Forum 2011 also coincided with Italy's 150th anniversary celebrations so one of the contests of this Forum was to stitch the flag or use the flag's colours. There was also a contest for quilts! So much to do and see, the Italia Invita Forum was divided over two paddocks, the contest entries in one building and the vendors and textile exhibitors in another. Fratelli Graziano had their first weaving loom threaded up with the colours of the Italian flag as they were celebrating their 170th anniversary (check this link for some photos). Overall there were 150 exhibitors. 8,754 people attended the Forum over three days (May 13-15, 2011) attendance was up 14% over 2009. 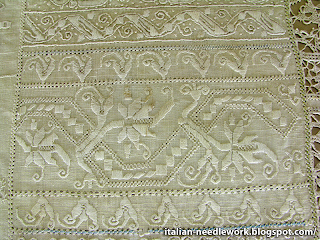 17 of Italy's 20 regions were represented with local characteristic textile techniques. I brought a better camera this time (last time my camera mysteriously stopped working the night before the Forum and started working again the day after it was over) but my photos where not great. Even the automatic movement stability feature couldn't stop my shakiness - too much excitement! This is very unfortunate because many exhibitors were kind enough to let me photograph their things. I wish I had good photos to show you but unfortunately I do not. The Italia Invita Forum offered workshops both free and paid. This time I opted for a paid workshop and took an intensive Puncetto course which I told you about here. There were many others I would have liked very much to have taken, 10 in total: embroidery techniques, filet lace, bobbin lace, needle lace, macramè, crochet lace, tassel-making and weaving. Two were Sardinian techniques that I have never before seen classes offered to the public. It was hard for me to choose which course to take but in the end I chose the Puncetto as I had already made some attempts at it and knew that I would like to improve. From previous experience I knew that the days would be hectic and exhausting but exhilarating as well. Meeting up with old friends and making new ones in an atmosphere where most of us felt like kids in a candy shop makes for an amazing three days. There are meetings and appointments and gatherings where everyone excitedly goes over purchases and experiences. 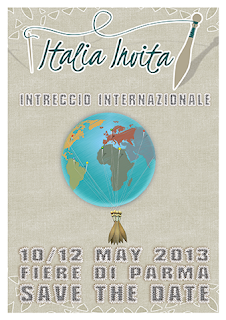 I will be sad to miss the Italia Invita Forum in 2013. Finances will not allow a trip to Italy next year for me, but if you have the chance to go, you should do it! So far details are scarce on their website but as soon as they can, I know they will announce everything. They do know that those of us who must plan for trips in advance are out here waiting for news!